Helping Hurricane Victims | HURAH! Left to right- Tom Luce, Evel Fanfan, Patrick and Lolo celebrating freedom and dedication to helping the poor. Evel Fanfan, Haitian attorney and human rights champion when we met at the National Penitentiary, site of hundreds of political prisoners. Among these was Lolo, a street kid rescued at age 11 by the staff at President Aristide’s home for street children, Lafanmi Selavi (Creole for Family Is Life). In spite of no case and a judge’s order to free him, Lolo languished in prison for 4 months, food bug infested, water contaminated and many people to one cell. After a week of intense shuffling from court to jail to police station, Atty. Fanfan obtained Lolo’s freedom on June 25, 2004. 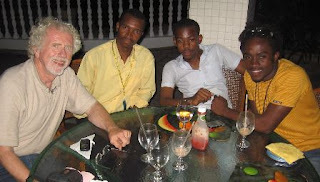 Both Fanfan and Lolo have continued to pour their lives out in service to the most poor of Haiti’s capital. He has been a community organizer as well as effective and absolutely pure attorney in liberating illegal prisoners. (A practice of some lawyers in collusion with corrupt police and judges especially during the illegal, US supported government 2004-2006 was to blackmail prisoners into paying for their release. Atty Fanfan and his group, AUMOHD, work for free. Santa Claus–Père Noël! Just as my camera shutter froze when I wanted to make a little video a crowd of school children at Don Bosco School, Cité Soleil, amassed around our car as we were leaving to do public awareness announcements about preventing water born diseases as a result of Hurricane Noël. 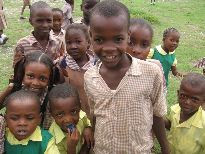 Earlier in the week a couple of these kids had been present at preliminary meetings and began calling me as often Haitian kids have done, “Père Noël” This time they raised the cry and kept us from leaving for several minutes! Fun! Yesterday we met at Don Bosco’s to hold a press conference covering the community awareness project before we left in two cars with bull horns and factual exhortations to the people to avoid contact with the muddy water and to participate in water purification projects in the coming days. This is an extraordinary community organizing project for many reasons: an undertaking by a private group–AUMOHD–a vast territory of lowlands and 300,000 inhabitants divided into over 13 local communities. Each local community has at least 5 separate water sources and some have huge water towers. Atty Fanfan has a great gift at bringing people together and helping them to collaborate instead of being beaten down by their circumstances. He has brought the Mayor together with the people with his gift of persuasion. On Monday when we went to the outlying, most hard hit locales the people began putting up roadblocks to protest the lack of city and state government help and reported criminal activity in the shelters. When Atty Fanfan finished his meeting, everyone was convinced that working together was the best way to get the job done. The local Community Human Rights Council (CHRC) established by AUMOHD has solid roots in this vast poor zone, pastors, school directors, community leaders. 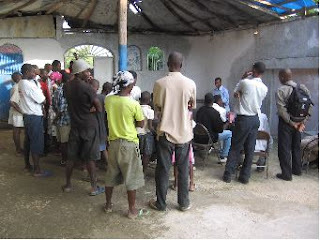 The coalition (Haitian Non-violent, Non-Partisan Coalition-HNVNPC) formed at the height of battles between armed groups and the UN troops last New Year. Shortly thereafter a ceasefire was achieved. The HNVNPC continues to collaborate on all aspects of community development and is leading this disease prevention effort.